revisiting a mountain scene…but this time, with a more dramatic sky. 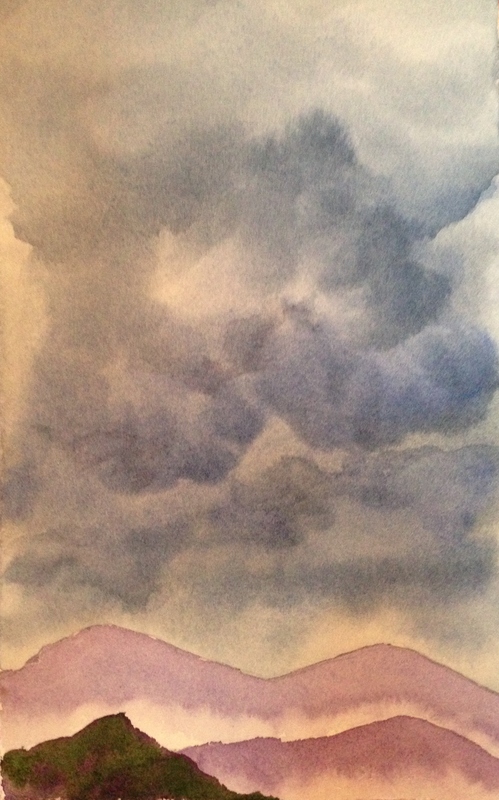 Skies in watercolor, for me, are still like a box of chocolates (to quote Forrest Gump). I never know what I’m gonna get! I am starting to feel a bit more confident with my skies. I am (sloooowly) taking a Craftsy course on landscapes with Shari Blaukopf. I’ve only seen the first few lessons, but I did review the sky lessons once again before jumping in to this painting. For the first time, I used a larger piece of paper (5 x 8″) and the big (#16!) round brush that Shari suggested. It carries tons of water, which took some getting used to (my normal brush is much smaller, a #6 round), but it kept me from fussing, and helped add to the softer dimension in this sky, I think. I haven’t conquered skies by a long shot, but since they’ve been fascinating me since day one, they’re worth the effort. I shall press on! I wish everyone a peaceful and productive Tuesday, and hopefully I’ll be ready with a bird for Draw A Bird Day tomorrow! Stormy Monday! I like the dancing effect you get with your clouds. And my bird is ready and waiting. Woot!! Thanks! Ooh, that’d make a nice title. Dancing Clouds. :)) I need to start on my bird! I like it, Inari! I’m subscribed to Artist Network TV, which seems to be an even better bargain for me due to the huge variety of videos and price per month ($20), but I do like the class. I’m glad you like my sky! Thank you. Another good subscription service I’ve found is Art Tutor. Not quite as much content as Artist Network at last check, but same price, which I thought was a bargain for that one as well. Have you ever tried either one? You too, Inari! Ooh, art school. Nice!! I’ve heard good things about Sketchbook Skool too. The sky fascinates me, Margaret! I have endless sky photos!! I’m glad you’re enjoying them. That´s really good, a sky requires room, I guess. I don´t really paint skies, they are more of a background in my paintings or drawings. I´m more interested in portrait or figures, all you can draw basically… And I think skies are really hard, because there is hardly anything more beautiful sometimes. It´s kind of like Gods canvas. 😉 But likewise there is no better medium for skies like watercolor, I think. Your progress is amazing at doing skies! Aww thanks, Ann. Your figures are always amazing. I agree, there is hardly anything more beautiful than a sky. It is God’s canvas; what a great way to put that! I am thinking about possibly selling my work. Been mulling this over for forever! How have you been liking your experience with that? Are you happy with the platform you chose, and how it’s going? You should definitely try to sell it, but I have to admit that it´s hard… I think on the platforms I´ve chosen until now I haven´t sold anything (society6 in the USA). I think selling online is really hard because there is such a lot of amazingly good stuff on the internet. And you can´t influence the print quality. I registered a small enterprise now here on Germany (to get a tax number and be able to write invoices) and I will try to sell my stuff now “in reality”. I need to find a real good print shop and then will get my stuff printed in good quality (postcards, buttons, posters, framed stuff) and then I will try to sell it to shops or on art- or flee-markets. Maybe that´ll work. Online I want to try out etsy and dawanda – but there you have to mail your stuff/prints yourself. I´m quite excited and curious about all of this. I think you should definitely also try it! Oh so dramatic, i love it. I can hear the thunder. This painting is just like the sky’s last night in Las Vegas. We had a big needed rain. Laura, good to hear you’ve move up in paper size, this means more confidence! Beautiful art today. Thanks Jill! Your imagination has no boundaries!! I don’t see it! Hehe!! Nice tonal work on the clouds giving them good volume. Why not try and lose the hills into them, by dropping the tone on them. It might unite the sky and the ground a bit better. That’s a great suggestion, Graham, I appreciate it! Beautiful stormy clouds Laura – nice height and buildup. Thanks, Lin, I appreciate it. Skies are tough! But so beautiful! Wow! The whole landscape is marvelous but the clouds are stupendous! So cool :-). Looking good! Clouds are fun to paint! i love gazing at the sky. Great sky, and I really like the greenery on the foreground mountain. 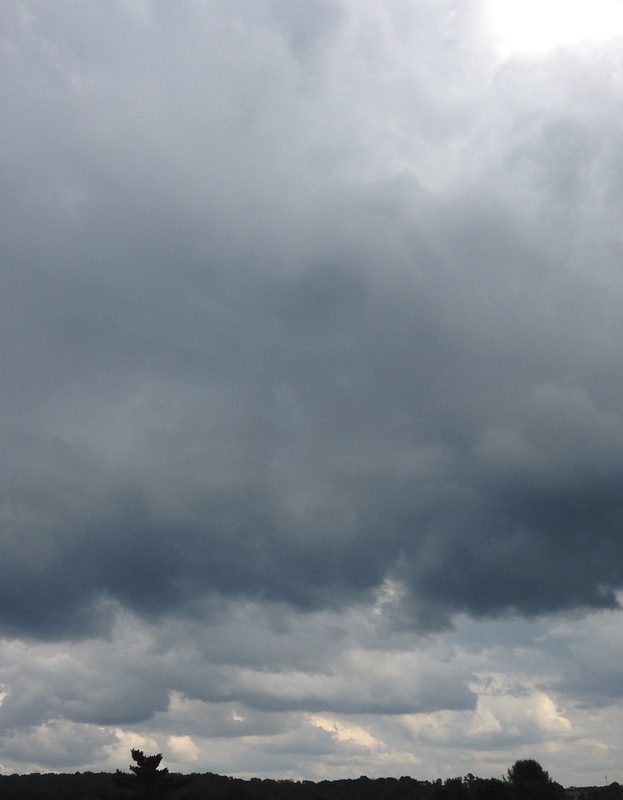 I love the drama of the cloudy sky…it seems to have more character than the one in the photo! very lovely, atmospheric clouds with good tonal values !! great sky 🙂 you using different paper? and brush ?? Thanks, Debi! I’m using the same Arches 140 lb cold press paper, but I did go to a #16 round for the sky vs the 6 I usually use. Much larger brush. Definitely helped with the sky, I think. looking Great 🙂 clouds are delightful ! Thank you so much; I’m glad to hear you like them! I do enjoy painting them also.